BIO: The Eagle started training in Nashville,TN with MCW (Music City Wrestling) at the age 14. Because of his hard work ethic, dedication, desire, and will to live out a life long dream he graduated earlier than others. As the youngest trainee, he was up against guys of the age range of 22 all the way to 30. The Eagle has one big heart for this profession he dearly loves. The Eagle's first match, he wrestled Stylin' Shane Eden. And they wrestled to a draw. The Eagle was first trained by Brickhouse Brown and then later on picked up by The Green Hornet aka (Buddha) to become his predecessor. He won the XWF Inc. World Title by defeating Bishop Slade in a violent match after winning a battle royal for the title shot at a previous event. 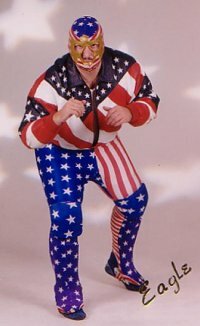 Eagle dons the USA tights and is a very proud American.